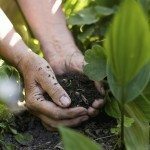 What do you need to make the garden soil from scratch? I am making a raised garden and making the garden soil from scratch. What I am planting is tomatoes, onions, squash, cucumbers, and bell peppers. I like to recommend an easy mix and way to fill a raised bed. Purchase both screened top soil and a high quality compost. Mix these 50-50, this is could balanced start to grow vegetables in. Take your raised bed measurements to the garden store and they will help you determine how much to buy. The top soil and compost can be purchased in bags, so they can be easily transported and handled.